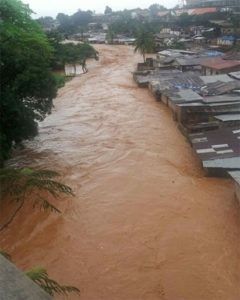 President Ernest Bai Koroma of Sierra Leone said Tuesday that his country needed “urgent support now” for thousands of people affected by massive flooding and mudslides in the capital of one of the world’s poorest nations. Addressing the media in the Regent hilltop community of Freetown, one of the areas hit hardest by a mudslide that has destroyed homes, Koroma fought back tears as he said the devastation “was overwhelming us”. “Entire communities have been wiped out,” Koroma said at the disaster site, where heavy rains streaming down the hillside engulfed homes three or four stories high on Monday, many of them built illegally. The Red Cross has said it was struggling to bring enough equipment to the site to excavate those buried deeply in the mud, but several bodies were extracted by available machinery at the site on Tuesday morning, according to an AFP journalist at the scene.